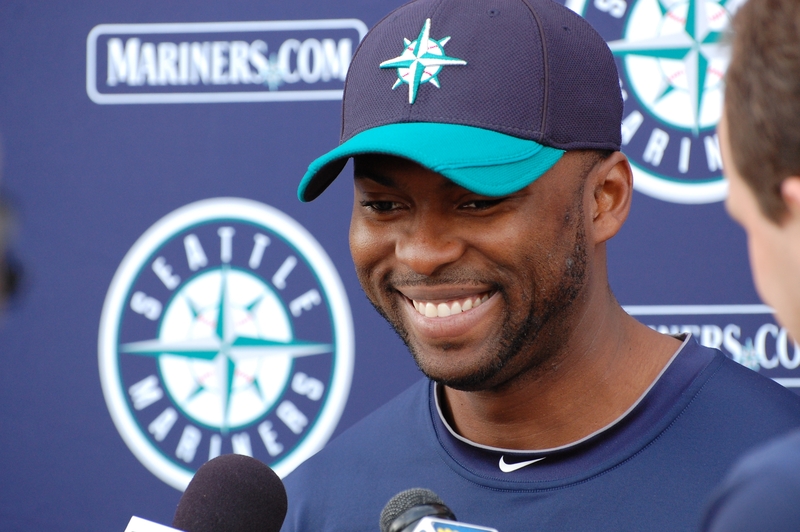 Milton Bradley reported to camp this morning, wearing a dark blue top with “USA” on the back, and filled with optimism that that this will be a fun-filled season with the Mariners. Bradley, acquired from the Cubs for right-hander Carlos Silva in a deal that basically swapped big contracts and disgruntled players, stoically walked into the Mariners clubhouse at around 9:15 a.m., found his locker — located next to Mike Sweeney and two stalls away from Ken Griffey Jr., changed out of his civilian clothes and into his new uniform. His first smile came moments later when Griffey entered the area. They exchanged hugs. Before having his physical at 1 p.m., Bradley had his first press conference. It went well and will be posted on the Mariners web site later today.